I have thoroughly enjoyed bringing you some wonderful strategies over the last 8 weeks. Most of these strategies have been for the primary grades. 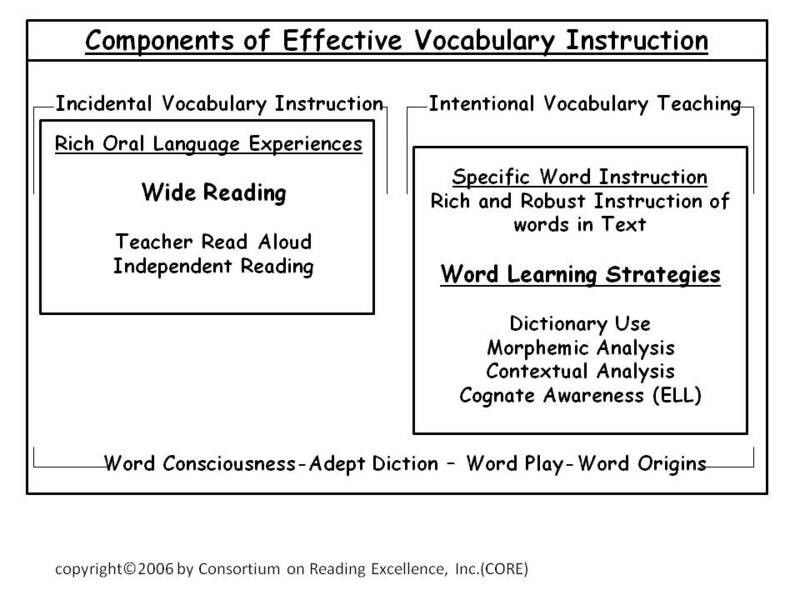 Below is chart of the complete components of Effective Vocabulary Instruction. 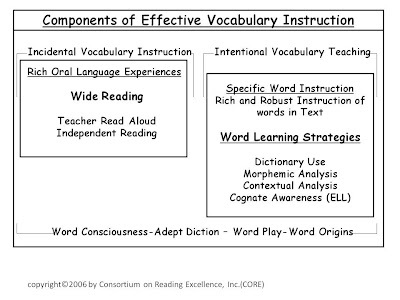 The components covered were Incidental Vocabulary Instruction during Read Alouds and Independent Reading and Intentional Vocabulary Teaching: Rich and Robust Instruction of the Tier 2 Words in Texts. As unfamiliar words are encountered repeatedly over time, word knowledge grows and the words move from level 1 to level 4. What researchers, such as Hart and Risley (1995), have found is that there is a significant vocabulary gap of children from disadvantaged homes of about 1,000 words before they enter Kindergarten. Without intervention this gap grows even larger as students progress through school. Even with teaching at least 2 new root words a day from Kindergarten through 2nd grade by the end of 2nd grade the average student will have learned 6,020 root words and those in the bottom 25% will have learned 4,168 new root words. In order to close that vocabulary gap these students will need to learn 3 to 4 new root words per day (Biemiller 2003). We know that understanding word meanings is key and essential to comprehension. 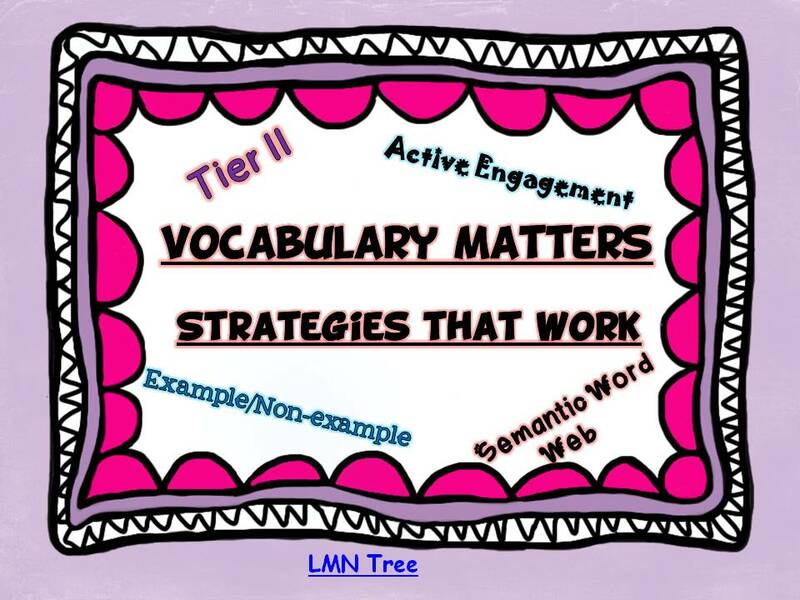 How important is it to find 10-15 minutes a day to devote to Specific Vocabulary Instruction? I know it was for me. Whether you add a few extra minutes to your Read Alouds or find a creative way to use time before or after lunch, or at the end of the day before going home, I hope you will try at least one of these strategies before the end of the school year. 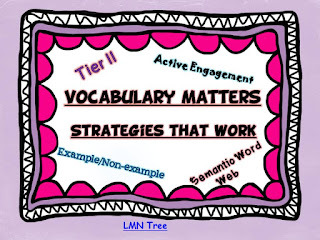 I hope you will leave your feedback about this Vocabulary Matters Series below and if you feel that reexamining it again in the fall along with the final component: Word Learning Strategies would be valuable to you please let me know. If you have missed any of the first 7 parts here are the links. You can download a free copy of the Wrap Up by clicking HERE.